Some of you might have heard Bebe launched their petite line a few months ago. Bebe's petite line is targeted at women 5’4” and under. I have always been a big fan of them. Bebe carries a nice selection of pencil skirts and it’s almost a guarantee that size zero will fit me. I noticed the other day that more than half of my pencil skirts are from Bebe. Lately, Bebe's style is getting a bit too trendy for me. On the other hand, maybe I should say I am getting too old to wear Bebe clothes. Regardless, I am thrilled that PR agreed to send me a few pieces from their petite line to introduce to my readers. The package arrived at my door the very next day with a cute little note. Bebe has been around forever. We are all familiar with what they have to offer. I received these items two months ago when their petite line first launched. I know people say not to wear white after Labor Day, but the purpose of this review is to (hopefully) give you guys some useful information regarding the petites fit vs. the standard fit. Below are the items they sent me. At the time, these were the smallest sizes they carried. This jacket is so adorable. It is very different than anything I have in my closet. As you can see from the stock photos, it has a detachable hood. It can be worn without the hood for conservative environments or with the hood for less formal environments. I love this cami. It’s so comfortable to wear because of the super stretch material. It also has adjustable straps which are a plus for petites. Pintuck ribbing runs down the center and sides and lace trim finishes the hem. This is a great piece to layer beneath a sweater or jacket! Fit: Because of its stretchy material, the fit is great. The total length is 20.5 inches which is a great length for petites. I received these pieces two months ago when their petite line first launched. Therefore, the selection was very limited. The smallest size available back then was 2P for this trouser. I have no doubt in my mind that they are going to be enormous on me. Sure enough, the waist is too big on me. I forgot to snag some before photos. I know all I need is a simple alteration job to have the waist taken in. Believe it or not, this is my first experience ever with alterations. My Mom fixed all my clothes previously. I know I am spoiled. She said no this time because the pants are 100% lined. I know it would take her forever to alter these pants unless I harass her every weekend. 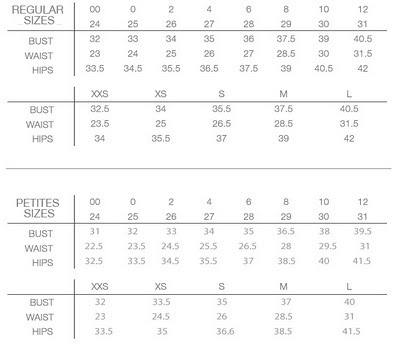 Take a look below for comparisons between regular sizes and petites sizes. Based on those measurements, do I need petites sizes? Not really. Size 00R would be a better choice for me since I would need regular length with a smaller waist. Although, for some of you who are smaller than me, petites sizes will probably work out better for you guys. Overall, I am enjoying this outfit so much (although the linen wrinkles like crazy). Too bad I can’t wear them again until next year. Bebe has added much more to their petite line within last month. So be sure to check it out. Stay tuned for a small giveaway later this week. Disclosure: I included the barcodes just in case you’d like to call the stores and check on your sizes. The jacket and trousers are on a major sale right now. I received all items in this review courtesy of Bebe. As always, my reviews are my personal opinion. I will not be compensated for posting this review on my blog. I don't think I'm seeing things that your hair got much longer since a week ago? :). The texture is very nice! I really like the jacket on you. I don't have anything in my closet from Bebe. Thank you for sharing with us about their petite line. Congrats on the new pieces :). You look SO gorgeous, I am developing a mild girl crush on you. :) I haven't ventured into Bebe for suiting separates yet but I have been itching to try since Really Petite reviewed it...now I have to. Too bad the nearest Bebe is still pretty far away...and I think white suiting separates can work for the fall too. To heck with that stupid no white after labor day rule. I really like how it looks on you and I am always short one white blazer in my closet. Thanks for the review. Nice review...your hair looks great here. DO you feel that the sizes run consistently? Since you tried on 00R, SP, and 2P and they all look like they fit you in the pics, I'm curious how those sizes would fit on someone my size. Really great review! I don't think I have anything from bebe - when I walk in the store I usually get turned off because it is too trendy and seems pricey for me. CUTE! Love your hair and the necklace you paired with it. I love the pant suit you are wearing! The fit is great on you. Looks wonderful! You look FANTASTIC in your BEBE PETITES!!! I soo want to review them too. We are about the same size! WOW you look amazing with the extensions and a white suit! Judging from the size charts, I think I'm a petite 00...I never shop at Bebe, I really should consider checking them out. I always had this idea in my head that they're way too flashy. Do you know if the petite line is available in Canadian stores? Is the jacket made of linen too? I love the lapels and you look great with it unbuttoned. Thanks for the review! Even though you look fantastic in the suit, the first thing I noticed was your hair! My goodness, it looks like your hair grew 6 inches overnight lol. If those are extensions, they look pretty darn good! As for the suit, those pants fit you like a dream and the jacket is really cute too. I've always thought Bebe was too trendy AND expensive for me too, but I like that they're offering smaller sizes now. I'm still hoping they'll expand their petite line though to include more items, because the last time I checked there were very slim pickings. You look amazing! Lol at Elle! Your necklace is gorgeous! I'm loving the longer hair on you, it suits you so much! Great review, I really like the outfit. Your hair looks AMAZING! My cousin LOVES bebe, but I find most of their items to be too "flashy" for me. I'll have to check out their work pieces sometime though, because those trousers look great on you! i love your hair!!! so pretty...i think it a lot!! the bebe jacket and pants look great! bebe stores in Sf have always carried petite sizes...well in certain stores. i actually have a lot of bebe trousers in 00P and 0P and regular sizes. I definitely think they don't have consistent sizes at all. So I know this is a clothing review.. but can I just say your hair looks fab curled at the ends like that?? You look so pretty in these pics!! I love the white suit and your hair looks amazing long. I will definitely have to check out bebe petites. Oh wow. The jacket and pants look great on you. Thank you for the review. I'd definitely add these to my wardrobe if I had any occasions to wear this. And I don't like linen stuff for its wrinkles. Too hard to take care of. You look amazing with your hair extension! @Cee: Yes, the jacket is made out of linen too and 100% lined. @Ping: I have about 5 pencil skirts from Bebe. So far their sizes run consistently on me. That's just for pencil skirts. I don't have any other pieces to compare with. Love everything from hair extension to your very chic outfit. You absolutely look fantastic. The combination of black and white are so chic, sleek and modern, it is my all time favourite. hey hun! check out our amazing giveaway!! it'll last until friday! don't waste this chance!